I’ve been enjoying a lot of hockey lately. I’m excited to see the Toronto Maple Leafs and Edmonton Oilers in the playoffs, assuming the Leafs can clinch a berth. 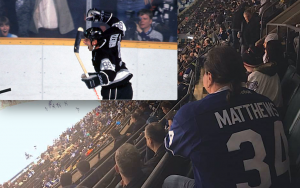 One of the most exciting things to see is the turn-around of my hometown Toronto Maple Leafs, mainly due to the historic and unbelievable season performances of rookies Auston Matthews, Mitch Marner and William Nylander. Nazeem Kadri is having a pretty amazing year as well. Last night, I bought my first NHL jersey in 29 years. 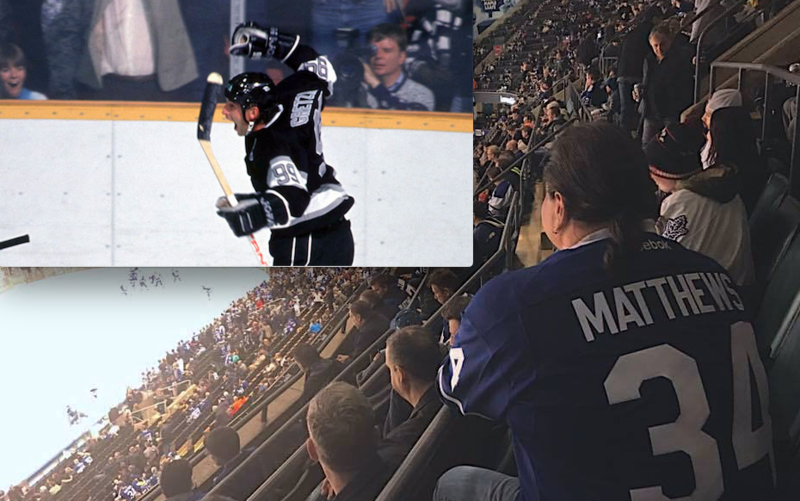 I picked up a Auston Matthews #34 jersey at the Leafs/Lightning game. It’s a pretty exciting thing to see this young man, in his first year, score so many goals, night after night. I’m looking forward to cheering him on throughout his career. I did have a wool, knit Leafs jersey when I was six years-old. It got me to reminiscing about my favorite hockey player of all time, Wayne Gretzky. During my childhood, I watched as many Oilers and Kings games as I could on satellite TV and read the NHL Scoring Leaders section of The Nugget everyday. A few weekends after he was traded to Los Angeles in 1988, I bought the Gretzky # 99, white home jersey, marked with the captain’s ‘C’. To this day, my favorite NHL teams are Toronto, Edmonton and LA. I was Youtube-ing some of Gretzky’s highlights and I came upon the night he broke Gordie Howe’s record. I remember that night very well, October 15, 1990, because many of us Gretzky fans had been following and awaiting the feat where our hero would surpass Gordie Howe to become the highest scoring NHL player of all time. Classic Gretzky… late in the 3rd period, the Kings goalie is pulled… he comes out from behind the net, parks to the open side of the Oilers net and pounces on a backhand into a wide open net. It was historic. The league actually stopped the game in the 3rd period, with a 2-2 tie, to honour Gretzky. Gretzky addressed the cheering crowd in Edmonton. He was classy. The Oilers were classy. And the fans were classy. You can see the genuine smiles and congratulations offered by Oilers captain Mark Messier and teammates on both sides. By the way, a few minutes after the ceremony, Gretzky scored the game winner. Amazing. Of course, Gretzky had many a career moments like that. Dozens of NHL records and milestones. Plenty of memories for a hockey fan. I was fortunate enough to see Wayne Gretzky play in Toronto in 1998. It was the only time I seen him in-person. The Leafs may never lift the Stanley Cup anytime soon and Austin Matthews isn’t likely score 92 goals in a season. But things are certainly looking up for Leafs fans in Hogtown. Once again, Toronto Maple Leaf players and fans get to watch from the playoffs from the comfort of the golf cart. The once-great Blue-and-White failed to make the playoffs for the sixth season in a row. The last time they smelled playoff ice was 2004. I say “once-great” in a historic sort of way. They haven’t won the Stanley Cup in my lifetime. I was too young to know Lanny McDonald and Darryl Sittler. I cheered for Mike Palmateer, Borje Salming and Rick Vaive as a kid because I didn’t know any better. And sure, I long for the days of Mats Sundin and Wendal Clark. But the truth, there is very little to be excited about with the Leafs since then. In my humble opinion, we need either a fan revolt or a new winning strategy. There’s really no incentive for Maple Leafs Sports and Entertainment and the TML business management to win. Their broadcast revenues are always a sure thing, as is their corporate revenue. The Air Canada Centre seems to be sold out each and every night. Why take any risks when the business model is working? I’d recommend that the Toronto Maple Leafs clean house and announce a new winning strategy. I mean real Charlie Sheen #Winning!! 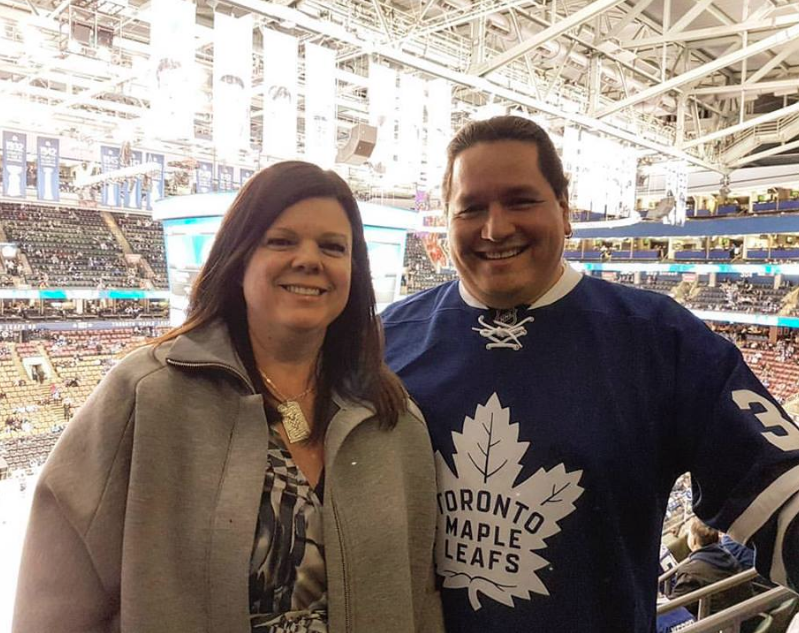 Let Leafs fans know that they will be cheering for a developing team for the next two seasons. Come season three, we will have a team ready to compete for the Stanley Cut. Ask for some patience, and lay out the strategy. Leafs fans, although insanely demanding, have been patient since 1967. The Toronto Maple Leafs will put together a whole new team dedicated to re-building, improving scoring, special teams and developing Reimer as the long-term goalie of the future. Clean house, right from the Team President, Management, Coaching Staff, right down to the stick boy. How about using those big-bucks to hire the best General Manager, Head Coach and development staff a team can get? I’m pretty sure there’s no salary cap on team officials. Set the tone and hire some inspiration like Wayne Gretzky. Put some real research and development investment into the scouting and the development process. Send a re-invigourated scouting staff across the planet in search of the biggest, the fastest and the best. Turn conditioning into a team philisophy. Conditioning, not as individuals, but as a team. We need a Toronto Maple Leafs machine of youth, stamina and ability. I may not be cheering for the Maple Leafs on a regular basis. They seem to be grasping at straws year after year. But if MLSE and the Toronto Maple Leafs were to put together something so exciting, outlined a winning strategy and they ensured a Stanley Cup contended within a certain timeframe, I’d cheer them on… even if it took a season or two.